I think as a person gets older, the harder it becomes to express oneself. Last Thursday was the ISA AGM. Half heartedly, I didn't feel like going that night. It was not only because of the usual cramps that time of the month (yeah I don't care about too much info! ), but also because I was sure I'm gonna feel left out. The over-whelming part was having to walk into 1N207 again, where everything brought back so much memories. Memories of my ISA AGM, where my friends cheered me on taking the role of Publications Officer, I almost wanted to break down in tears. Man I miss you girls so much. Then it didn't help when someone pissed me off. It's times like this when I wished chaboh loo comes to my aid, then I'm sure the guy would run 10 miles away! The small incident happened when we were lining up for food, the line was moving when Tubbs called me to move forward. Then out of nowhere, this guy walks and bumps into my hand and he drops a piece of food on the floor. I said sorry even though it wasn't my fault. But he stared at me as if I stole his food or something and even muttered that I didn't see him coming and knocked into him! I was so PISSED OFF because tubbs was happily chattering away with someone else, oblivious to what happened! I muttered back, "Hey you're the one who bumped into me, what's your problem!" The worse part was that he is a GUY! One that is NO GENTLEMEN at all! And worse still, he's Malaysian! What a disgrace to have such a fellow countrymen. I don't know his name, but I do know he's an outcast amongst fellow Singaporeans/Malaysians and only the Chinese accept him. Anyway it was too much for me, I left soon after. On a happier note, last Friday was the Badminton Club Awards Night. Surina and I came in 1st in the Women's doubles and Wangwei and I came in 2nd for the mix doubles. (I wished it were this good in tennis as well! Anyway it was all good and all fun, and we had pizzas and KFC for dinner. 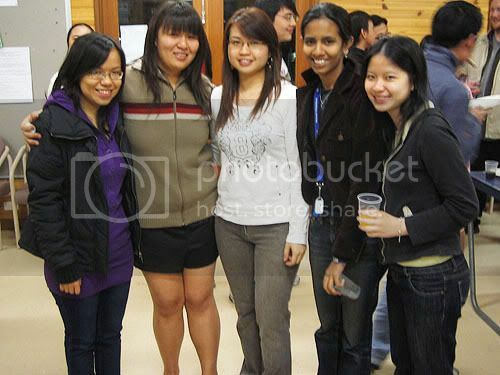 From left: Cynthia, Greenie, Me, Surina and Sue Li. Any other personal statistics, drop me a note ok? Hahaha..
Sure will reserve our time for u!! Miss u lots lots! Gosh you have no idea how much I miss you girls.. I feel so lonely sometimes here without you all.. Miss the laughter we had, shopping, clubbing and best of all, just being together.. *sob sob*..
Ooo Mel's coming back next year! Fun, we'll can meet up. Don't forget me leh... :) Take care Mel, miss you too! aiyoh chaboh,at least u still have tubby mah. I'm even worst than u, i'm all alone in KL, though is near home n have friends but how much they can be my company and they can't always be by my side. So i bet i'm more lonely than u...ai...where is my prince charming??? Chaboh loo.. he's coming, he's coming, don't worry.. Tubby say he wanna find Sumo for you.. I knoowwww I smack him for you already.. If not enough you tell me..
Hi Pal, no need to get upset about the guy that pushed you k..he probably same as you ...that time of the month but he didnt know how to control his emotions and it got the better of him..hahahaha. OK..he's a jerk..no excuse for him. to looloo: Hehh.. Tubby now already look like Sumo Junior lar.. wahahaha.. Oooo Tipsy liliz nia..